It was a difficult conversation with my boss that started the ball rolling on NoBaffles.com: “Joe, you can’t ignore social media any more. You’re going to get left behind in your career,” he said over lunch about a month ago. Many of the new social media and social networking tools befuddled this blogger for years. My writing abilities and business experience have been my calling card in my public relations career. I was one of the few PR professionals who had been a corporate executive, come from a finance background, and found my way into PR through investor relations and corporate finance. My ability to understand the businesses we worked with and quickly digest their value propositions, to digest financial statements, and communicate with the C-suite had differentiated me from my peers. But recently, the worm had turned. The rise of social media tools like Twitter, blogging, LinkedIn, Facebook, and others like them had given companies the opportunity to be the media, to be a source of information. My peers who knew how to use these tools to build audiences, identify and connect with influencers, had become more and more sought after – and more and more valuable within my firm. I was facing a world where my skills would be marginalized and secondary afterthoughts. I knew he was right. It was time at age 46 to learn new skills. It seemed daunting. I’ve always enjoyed using Facebook to connect with family and friends, but Twitter was a mystery to me, with its hashtags and @ signs and illegible abbreviated URLs. I had tried my hand at blogging on a number of topics over the years, but always seemed to run out of steam. I had a LinkedIn account but still hadn’t found the ‘killer app’ for it, and it remained simply a collection of business contacts housed online instead of in my MSOutlook contacts folder. The weekend after the conversation, which occurred on a Friday afternoon, I did a lot of soul searching. Eventually I realized that it was time to dive headfirst into this brave new world. And the idea struck me that if I was going to learn these new skills and new tools, it would be a lot easier if I was passionate about the subject matter. So I decided to start a blog and Twitter account focused on motorcycles, and more specifically on first time riders. Perhaps while learning a new skill I could connect more would-be riders with motorcycling. Perhaps I could help motorcycle dealers better serve the new rider audience and expand the sport to others to grow revenue and grow the industry. And in the back of my mind, I always thought I’d like to find a second career in the motorcycling industry – maybe one day open a dealership of my own. By blogging perhaps I could learn more about the industry and prepare for the day when that dream might become a reality. NoBaffles was born with my first post, Two Wheels Good, on November 10, 2011. I spent the next couple of weeks doing what we coach our social media clients to do: writing a number of posts each week, publicizing posts using social networking and social bookmarking tools, and connecting with like-minded peeps on Twitter. I talked to a Twitter-savvy colleague and got a tutorial on Tweetdeck and some pointers on Twitter etiquette. I talked to our firm’s social media guru and learned how he had build a following of over 16,000 tech gurus on Twitter (hint: hard work, determination, and a commitment to be one of the BSDs in tech social media). I started to implement some of his best practices. In other words, I jumped head-first into the world of social media, social networking, and blogging. It went well. One of my frustrations in previous blogging attempts was that I could never really see the results. I always felt like the comedian tapping on the microphone saying “Is this thing on?? ?” But because WordPress has built-in site stats that enable the blogger to monitor traffic, I could see that my blog was getting readership. It was like instant gratification. I would publish a post, publicize it through my social networks, and see eyeballs hitting the post. 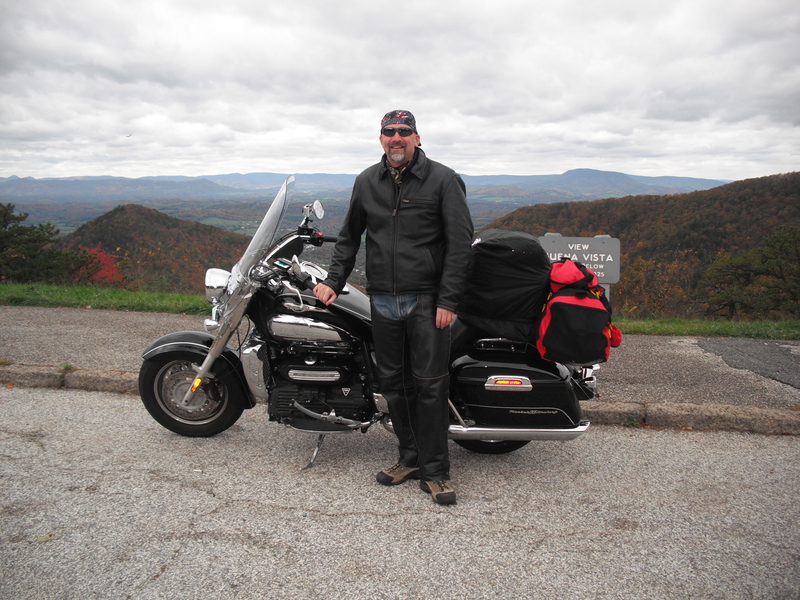 I started to get comments from a fellow motorcycle blogger, TwoTireTirade. My blog started to show up on Google searches. And friends were telling me how much they were enjoying my writing. The quantitative and qualitative postive reinforcement was invaluable. Then, two weeks ago while perusing Twitter, I saw an extremely intriguing ‘tweet’: December 8: Are you a motorcycle blogger? Do you read motorcycle blogs? We want to read and share your blogs – post a link on our Facebook page so we can get to know you. More intriguing was the fact that the tweet was from one of the organizers of the Progressive International Motorcycle Shows, the folks who put on a dozen motorcycle shows all over the country. Fast forward to Friday, December 17. Arrival of a direct message on Twitter: Hi Joe! You responded to our FB post for blogs and I’d love to talk about getting you to a Show! After some email back and forth, I was invited to attend the New York Motorcycle Show on January 19-21 as “VIP Media.” A press pass would be waiting for me at the door. I would get four tickets to the show to give to friends or to give away to my readers. All that was asked in return was that I would cover the show on my blog and in my social media channels, something I had intended to do anyway. So who knows where this will go. I’m learning, and applying many of the principles from NoBaffles to my PR clients as well. Last week I found a story opportunity for a client; several new media outlets to add to my media list; and found a number of good news reports to send to my clients as FYIs because they impacted their business. Social media is helping me add value and be a better PR rep. And I have found myself asking on several occasions, “Why did I wait so long to use these tools?” I’m just glad this old dog has decided to learn some new tricks. Now, I wonder what swag awaits a member of the “VIP Media” at the NYC Motorcycle Show. I’ll let you know when I cover the show Jan 20-22, 2012. « The ritual and religion of riding.